US Military Veterans: Your service prepared you as one of the best-trained, most value-driven performers in the world. Intel’s mission is to connect and enrich the lives of every person on earth. Put them together, and it’s called brilliant! Your talents. Our mission. A winning combination. Join us in our journey to change the world. Intel is looking for military veterans to start a career with a mission as big as the world. Start this journey by registering for Intel’s Military Veteran Virtual Career Fair on Friday, 31 Jan, from 10AM to 12PM (MST). The first 30 minutes will be reserved for an overview of Intel’s Military Veteran programs and recruitment efforts. The rest of the time will be used for veterans to personally chat with Intel recruiters. In addition to a general Intel Military Veterans booth, the following Intel hiring groups will be represented: 1) Sales & Marketing, 2) Software & IT, 3) Manufacturing & Engineering, 4) Supply Chain Management. This event is open to all US Military veterans whether you are seeking an internship or a full-time role. Finally, all attendees will be entered to win an Intel powered Samsung Galaxy Note 8.0. 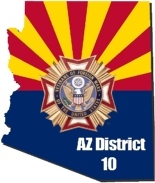 This entry was posted on January 28, 2014 by adamsdeanaz in Arizona VFW, District 10, Job Fairs and tagged Arizona Jobs, Hiring Veterans, Intel Jobs, Job fairs for veterans, Veteran Jobs.